We are listed among the most dependable Infant Feeding Tube Manufacturers in India. The connectors of the Knotted Infant Feeding Tube are of different colors that facilitate in the identifications of the respective size. 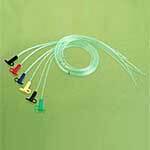 The Opaque Infant Feeding Tube is available in the length of 52 cm and size that varies from 5FG to10FG so as to suit the application. In addition to it, the cap is also available that prevents the connectors from contamination. Customers are also facilitated with the delivery of the infant feeding tube within the stipulated time frame. For neonatal and pediatric nutritional feeding. Flexible connector with cap to prevent reflux and contamination.